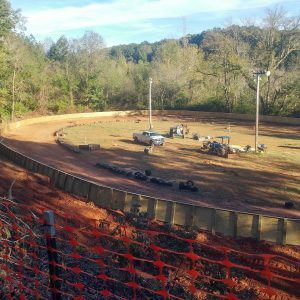 No one is quite sure when Mountain Creek Speedway ran its first race. What we do know is over 40 years ago, a family carved out the track on their property in the same layout as the famed Hickory Motor Speedway less than 20 minutes away. For decades, it was run as a private track where friends, family and select invitees were able to compete, have fun and enjoy the sport of auto racing in an affordable form. From this was born the “Little Mountain Kart Club,” named for the road off which the track sits. In late 2017, the track began to open up the events to more and more competitors from outside the normal realm of guests. The promoters toyed with extra distance races, 200-lap contests or more in a kart which gave racers more track time than anywhere they’ve ever raced, and it quickly became a hit. 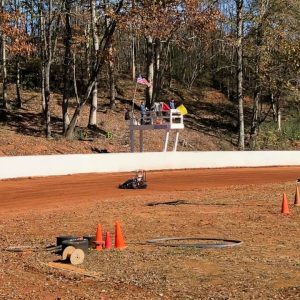 In response to such positive feedback, the management opened the facility to another popular class in the region, mini-outlaw karts. Quickly, the outlaw drivers clamored for more dates and more events, to which the track responded by adding events to an already growing schedule. 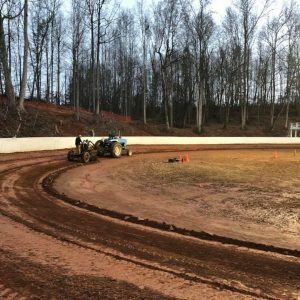 2018 and beyond promises to be the most productive times yet for Mountain Creek Speedway. Its unique location allows for cooler summer race days, great spectator viewing angles, and a unique design allows racers to race multiple grooves to find maximum speed no matter when raceday occurs. A nearby creek keeps the dirt moist and creates one of the most friendly race surfaces in the region, something that has added to the track’s success. Come join us at Mountain Creek Speedway. With down-home, southern hospitality, we’re certain you’ll want to come back again and again and again. Gear & Setup: A setup similar to other 1/6-mile tracks in the region should get you within one or two teeth gear-wise and pretty close everywhere else on setup.